Get the real skinny on fat. When it comes to losing weight, the false beliefs most of us cling to could fill a book–this one! 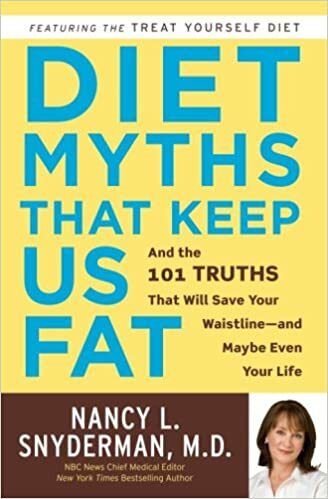 As a medical doctor, medical journalist, and veteran of the diet wars, Nancy L. Snyderman knows better than almost anyone what really works and what sabotages your best efforts to shed pounds and keep them off. Do you believe any of these prevalent diet myths? • Dieting is a waste of time–most dieters regain their weight before long. • Carbs are bad for you. • Carbs are good for you. • Calories don’t count–it’s the kind of food you eat that’s the problem. • Fat is fat–it doesn’t matter where on your body you carry it. • Diet drugs and surgeries are a magic bullet. In Diet Myths That Keep Us Fat, Dr. Snyderman reveals exactly why these and other bogus ideas get in the way of what should be the simple and even joyful endeavor of reaching and maintaining your ideal weight. In their place, she reveals 101 surprising truths–muscle doesn’t weigh more than fat, you can eat after 8 p.m. and not gain weight, you can eat dessert for dinner when on a diet, and 98 more. But here’s the best news: Slimming down and getting healthier doesn’t have to be about deprivation or superhuman feats of willpower. Instead, you will enjoy a new relationship with food–including those treats you love the most–while feeling fabulous inside and out. So forget the fad diets that work great . . . until they don’t, along with the negative emotions associated with everything from bathroom scales to full-length mirrors. Most of all, forget all the myths and remember what’s true: You can do this and you’ll never regret it for a minute.